Zimbabwe blocks Facebook, WhatsApp and Twitter amid crackdown – Royal Times of Nigeria. 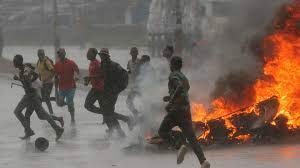 Zimbabwe has blocked Facebook, Twitter and WhatsApp messaging app amid a crackdown on days of violent protests. A coalition of local human rights groups says at least 12 people have been killed and many more beaten and tortured by security forces this week. The Zimbabwe Human Rights NGO Forum accused the authorities of cutting off the internet “to mask the massive human rights violations”. The protests were sparked on Monday by a sharp rise in the price of fuel. President Emmerson Mnangagwa said the rise was aimed at tackling shortages caused by an increase in fuel use and “rampant” illegal trading. But many Zimbabweans, worn down by years of economic hardship, suddenly found they could not even afford the bus fare to work.